We have already looked at some of the New Testament texts in comparison to texts outside the Bible, including texts of other religions. Here we take a look at the New Testament as a whole, compared to the Qur'an as a whole. As a reminder, this is not a comparison at the subjective level, but a mathematical comparison of how often different words are used in the texts. So you come across issues like translations, and whether the same words (even if we allow across languages that they are the same words) really mean quite the same thing in two different cultures. Still, for a person who wants an idea how two things are alike and different, it is a place to begin. The New Testament has a shared emphasis with the Qur'an of about 35%. Much of the overlap is due to the shared monotheism: "God" is the single most prevalent word in both texts, if we allow "God" and "Allah" to be considered a shared match, and if possessives (God's, Allah's) are included in that count. "Lord" is also common in both texts. The overlap also includes the involvement of God with people through his word or message, as shown in the common use of "man, people, men, faith, called, truth, earth, good, life" in both texts. Both texts keep in mind the matter of time and eternity, with both texts having "day" and "heaven" as common words (if we posit that "heavens" in the Qur'an translation used matches "heaven" in the New Testament translation used). From the New Testament's point of view, the New Testament's distinctive view of God is missing in the Qur'an, as the New Testament common words "Jesus, Christ, son, father, spirit" are not among the Qur'an's common words. The different view of God is a long-noticed key difference between the two faiths, and is confirmed as an objectively real difference by the relative word emphasis. The New Testament texts portray God as loving and benevolent like a father, and involved to the extent of sending his Word to live among us as human in Jesus, and participating in our life now by sending his spirit to live in his people. Other words that are uniquely emphasized in the New Testament are "love" and "holy", which are not among the important words in the Qur'an. It bears mentioning here that the Qur'an's use of "mercy" is not entirely different than the New Testament's view of "love", and the details of that is well outside the scope of this set of notes on the statistical differences in word use. The New Testament also has more emphasis on individual people and their history, as the common words include the word "disciples" and the names Paul, Peter, and John. The New Testament has more emphasis on the setting of Jesus and his followers, with "Jews" and "Jerusalem" among the common words. It looks to its Jewish religious setting with much discussion of the role of "law". While we saw the Qur'an along with the New Testament has a prominent place for the word "life", the New Testament also contains "dead" and "death" -- which come up in several instances, whether Jesus raising people from the dead, or God raising Jesus from the dead, or the New Testament teaching that Jesus' people are joined to him in death and therefore also in God's favor and resurrection. I hope to present the differences in chart form soon, rather than turn this discussion into a catalog, where a table or graph is a more suitable presentation for some material. From the Qur'an's point of view, the New Testament lacks the emphasis on judgment, hell, and the last day that are so prevalent in the Qur'an, where we have a whole series of common words that are not emphasized in the New Testament. "Fear, evil, penalty, fire, reject, unbelievers, reward, judgment, punishment" each have their own emphasis as keywords in the Qur'an. The persistent focus on hell and punishment is something that has caused comment among Christians who read the Qur'an, and again is confirmed as an objectively real difference by the relative word emphasis. The Qur'an at time considers the role of other monotheists -- and their writings -- in its common references to "Moses" and "book". It also does have some emphasis on "mercy" -- while less prominent than the New Testament's emphasis on "love", it may be comparable in some ways. The Qur'an's view of "guidance" may also apply here. Again, I hope to present the word comparisons in chart form soon, since a table or graph is a more suitable presentation for some material. This year for Lent, I have had to take into account that my schedule has changed a lot since last year. (Those of you who notice when I update the blog will have seen this by now. I have less free time now in the average day than I did a year ago, less than I've had for the last however many years running.) So I struggled a little to find a Lenten observance this year that was practical within that schedule. Why in the world would I mention such a small observance? Just in case anybody else has a year with a rough schedule. Lenten hymns or spiritual songs could fit into a morning shower, or rush time karaoke, or could be on an iPod. It may be a small step, but it is a step. There's always something. There were some unexpected obstacles in getting this word cloud. Unfortunately, the Qur'an seems to be too large for my previous free word cloud generator. This has potential to be important, since they may use different formulas to detect word frequency, for example controlling for singular/plural. I may need to re-check the new word cloud generator used here with some of my previous texts to make sure that it gives comparable results. From the results of this word cloud generator, I did have to clear out two-word phrases, since that is not currently in our list of things we analyze. The translation that I used, though done in modern times, used "King James" English. This was also preventing the word cloud generator from behaving in its normal way, since a word cloud generator will typically filter out words like "you" and "your" and "will" as not really being the most important words in the text, but have no such automatic filtering for the older equivalents like "ye" and "thy" and "wilt". Some careful searching and replacing was done to the text to modernize the language, at least for items common enough to affect the word cloud results. In this way the results were more comparable to all the other texts, which used modern English translations. The translation also had a large number of words in parenthetical comments, in the way that usually identifies words that are not in the original text but were instead added by the translator. There were a surprising number of such parenthetical words, enough that it would be worthwhile to repeat the exercise with a different translation. There were some instances where the text contained abbrevations (such as "a.l.m" for "Alif la mem"). This could potentially throw off the word counts, though it does not occur often enough to throw off the results by much. The text used in the current analysis does not include the invocation that the website printed at the top of each surah ("In the name of Allah, Most Gracious, Most Merciful") because that phrase was presented as distinct from the regular text of the surah. That is to say, it was set apart in a separate typeface and a different color, and was above the first numbered verse of each surah. For that reason the invocation was not included as part of the text that was analyzed. I think the text might best be analyzed both with and without the invocation as part of the official text, to see the difference. When given two options, I generally like to see them both. The invocation has only a few words that are not routinely screened out by the analysis filters (name, Allah, most, gracious, merciful), and "Allah" was already the most-common keyword. While I favor more analysis, this current decision would not affect the most-common keyword. To sum up, it took more hands-on involvement than was ideal before I had results that were reasonably clean, and still there were some specific items that might need a second look. These results should be considered a rough estimate until such issues are researched more completely. 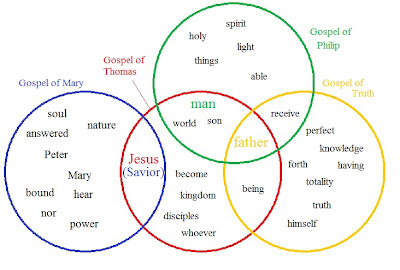 To compare this diagram to the previous one, we can immediately see that these alternative gospels are not as tightly related to each other as the Biblical gospels. We see that in an objective, measurable way: they do not all share a core set of keywords, or share the same most common word. With a high-level picture like this, a picture that shows only the ten most-common keywords from each document, some of the documents don't share any keywords at all. The Gospel of Philip doesn't have an overlap with the Gospel of Mary at that level, and neither does the Gospel of Truth. The Gospel of Mary only relates to the Gospel of Thomas through a match between "Savior" in the Gospel of Mary and "Jesus" in the Gospel of Thomas (more on that in the technical notes). In general, these documents have as much that is different from each other -- sometimes much more that is different -- than they have in common. Again, comparing the alternative gospels to the Biblical gospels, "Jesus" does not have as much of a place here as in the Biblical accounts. In some alternative gospels, "Jesus" (or a title like "Savior" to represent him) isn't one of the top ten keywords. For example, in the Gospel of Philip and the Gospel of Truth, "Jesus" is not represented in the top ten words, being relatively less important in those documents than other keywords or concepts. This is in contrast to the Biblical gospels where "Jesus" is the highest-frequency keyword -- the topic of first importance -- in all four. It is questionable whether "Gospel" is an accurate thing to call those particular documents that make no attempt to relate the life or teachings of Jesus, and where "Jesus" does not appear prominently in the top keywords. If a gospel is something that has -- or claims to have -- some record of the life and teachings of Jesus from a viewpoint of his early followers, then some of these documents simply don't meet that definition. Neither is it any complaint against certain documents to mention they do not meet that definition; they simply were not written with the purpose of recording the life and teachings of Jesus. (I've mentioned before, "unorthodox patristics" may be a more accurate classification for some of these documents.) Bear in mind that we are measuring the emphasis of all the documents in an objective way; the result is not something that depends on any ideology, belief, or lack of belief. We are not measuring things one way for the Biblical documents and another way for the non-Biblical documents: we have a level playing field, and all documents are handled in the same way. When we handle the documents the same way, we find there are some differences in what they contain. We are letting each document's contents set its own keywords, and measuring how often those keywords are used. Anyone would get the same results regardless of their views on the documents in question. It is not some sort of ideological thing to notice that some documents are mainly about Jesus while others are not; it is a matter of objective fact. Calling these other documents "gospels" may generate publicity, but it is done at the expense of accuracy about what they actually contain. 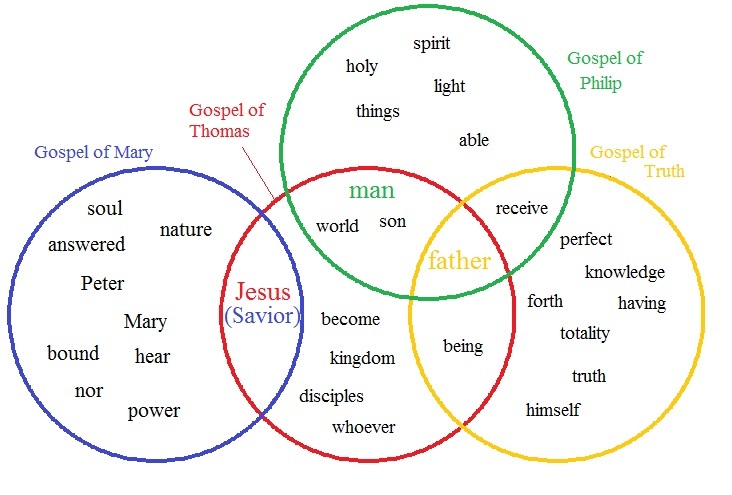 In the section where the Gospel of Mary and Gospel of Thomas overlap, "Savior" from the Gospel of Mary is treated as a match to "Jesus" in the Gospel of Thomas. The Gospel of Mary never actually mentions the name of the "Savior" in the remaining text that we have. Matching "Savior" to "Jesus" is a debatable move in a word matching exercise -- not because the identity of the "Savior" being discussed is in serious doubt, but because "Savior" is a religious idea or title, while "Jesus" is the name of a historical person. These differences reflect something you see when you compare the Gospel of Thomas and the Gospel of Mary side-by-side. The Gospel of Thomas aims to record the sayings of Jesus; it consists largely of a series of sayings introduced by the phrase "Jesus said". In the Gospel of Mary, the Savior makes only a brief appearance in person (at least in the remaining text that we have), and he is more often the topic of discussion among Mary and the disciples. So there is some question about allowing a word match between "Savior" and "Jesus" since they aren't actually the same word and are used somewhat differently. However, if we did not allow "Savior" and "Jesus" as a match in this case, it would give the impression that the Gospel of Mary wasn't related to the others at all; I thought it would be a more accurate representation to show that there was a match of sorts. There is a second difference between how these charts were made compared to the earlier one. Previously, when we looked at the Biblical gospels, all four shared the same most-frequently-used keyword: Jesus. To reflect this, "Jesus" was in larger typeface, and all the keywords were left in black letters since there was no need to distinguish a different keyword for the different documents. Here, the four writings have four different most-frequently used keywords. For Mary it is "Savior"; for Thomas it is "Jesus"; for Philip it is "man", and for Truth is it "father". To represent this, I have put the most-frequently-used word in the same color as the circle to which it belongs (that is: red for the most-frequently-used word for the Gospel of Thomas, and so forth). For a different type of technical note: I have been working on my diagramming skills a little bit, and I hope the next diagram will be slightly more detailed without losing its readability.